April « 2016 « Write, or Else! Time for Z in my Sci-Fi themed A-to-Z Challenge! Zero gravity, or zero-g, is one of those terms that was used in sci-fi before it was needed in reality. Arthur C. Clarke wrote about zero “g” in Islands in the Sky in 1952, making it the first time the idea was shortened this way. Many, many authors since have written about the apparent absence of gravity in space, and about people adapting to lower gravity environments like the Moon. In the real world, the term microgravity is preferred to zero-g because gravity is never really gone. Even if your spaceship is way out beyond the Earth and Moon, there is some small yet measurable force of gravity acting upon you. Astronauts working in orbit around earth experience weightlessness because they are in freefall – they are indeed still affected by Earth’s gravity, but they are also in a vessel that is moving forward. Effectively, they are “falling around” the Earth – the forward motion cancels out the downward motion, and everything inside the ship floats. Would you like to experience zero-g? Time for Y in my Sci-Fi themed A-to-Z Challenge! Doesn’t look too appetizing like this, huh? I guess this sort of an addendum to my post on vat-grown meat. Sci-fi authors have plenty of ways of feeding people without raising animals, and this one started with Isaac Asimov. In The Evitable Conflict, there’s yeast steak – various strains of customized yeast grown to replace regular food. Asimov brought up a similar idea in Caves of Steel, with vats that grow yeast to look and taste like food that’s difficult to get any other way. In the real world, there are plenty of foods processed with the help of yeast, but nothing that attempts to look and taste like a steak or a piece of fruit. Lab-grown food has a long way to go before it gets that far, but there are interesting new developments all the time. Time for X in my Sci-Fi themed A-to-Z Challenge! Xenology is a field that will really get started the second somebody confirms that life exists away from Earth. In a way, xenobiology already exists – biologists are trying to figure out where we should look for life and what we might see when we find it. The most viable candidate locations for life in our solar system are Mars and Jupiter’s moon Europa, so future missions will try to get samples of water from each location. The big problem for any such mission will be collecting samples without having any bacteria or viruses from Earth hitch a ride on the probe and mess up the sites they try to sample. Xenology is a much broader field that would include studies of alien biology, culture, society, language, and evolution. If intelligent life is ever discovered away from Earth, you can bet scientists from all disciplines will rush to become experts in various aspects of Xenology. The earliest use of “xenology” in sci-fi is a story by Robert A. Heinlein published as Star Lummox in 1954 in Magazine of Science-Fiction and Fantasy (it was later released as the novel The Star Beast). Many other works have speculated on the sorts of experts that would be called for once alien life is known to exist. Maybe I’m just a hopeful optimist, but given how life has been found in some of the most inhospitable places on Earth, I think confirmation of alien life will come within the next generation. It won’t be little green men, but more likely microorganisms like bacteria. Do you think we’ll see some news stories with the headline Alien Life Found in the near future? Time for W in my Sci-Fi themed A-to-Z Challenge! I’m cheating and going “behind the scenes” for W – instead of a concept used within sci-fi stories, I’ll talk about something used to write them – the process of worldbuilding. Have you ever been drawn so deeply into a fictional world, you had trouble coming back to reality? The author must have had a good understanding of the process of worldbuilding. Fantasy in all its various subgenres is most notorious for detailed worldbuilding, with Tolkien‘s well-developed cultures and histories setting the bar very high for the authors who followed him. Thanks to RPG pioneers like Gary Gygax, nearly every popular fantasy game has a developed world full of rules for magic, its own political and economic structure, and detailed histories for nearly every being and object encountered by players. Sci-fi authors have some really tough challenges in worldbuilding if they want to write about galaxy-spanning civilizations. Good authors imagine histories for each alien race, trying to incorporate facts of their evolution and their culture on their homeworld into the way they talk, act, and dress. If a sci-fi series has many different races, worldbuilding gets even more complicated – just how do all these species interact and get along (or fail to get along) with each other? Are you ready to take the plunge into worldbuilding? Oh, I’ve got some bad news for you if you have the urge to write fantasy, sci-fi, or any other genre that requires a lot of speculation. Worldbuilding is hard. Like really, really hard. There are lot of big pitfalls that authors have to avoid – most of these spring up from not thinking through the connections between the different facets of the fictional world. However, taking the time to answer as many worldbuilding questions as you can pays off big time. If you tackle a few questions every day in your writing diary, your ability to show your imagination will certainly improve. Do you have a world you want to build? Time for V in my Sci-Fi themed A-to-Z Challenge! How to get meat without all the mess. Sci-fi authors wrote about meat grown without the need for raising animals for decades before stem cell research was commonplace. In 1962, H. Beam Piper wrote about “carniculture vats” in his novel The Space Viking. In his story, spacecraft had vats to grow meat to supplement hydroponically grown vegetables. In the 1969 novel Whipping Star, Frank Herbert wrote about pseudoflesh – meat grown without animals. Many other sci-fi novels feature variations on the same idea – many people have realized the need to grow meat within a limited amount of space, such as the confines of a spaceship. Bringing animals into space, raising them, and then butchering them and processing the meat in space or on a newly-founded colony would be impractical, to say the least. Vat-grown meat provides a way around all that mess, and makes an excellent explanation for how spacefarers can maintain a healthy diet. It’s still expensive, but vat-grown meat (or in vitro meat) has been produced. In 2013, the first lab-grown burger was produced. It didn’t taste very good, apparently, but the work is very promising. Lab-grown meat has the potential to reduce greenhouse emissions and address other problems with farming animals, and you can bet that space travel organizations are watching the latest developments carefully in hopes of supplying new and better food during long space missions. If a lab grown burger tasted just like the real thing, would you eat it? #AtoZChallenge – Unobtanium, the plot-device material! Time for U in my Sci-Fi themed A-to-Z Challenge! Okay, I came up with a kind of weird / funny one for U, but it is very much entrenched in sci-fi (and other fiction). The reason humans went to a planet full of dragon-riding smurfs. Unobtainium is exactly what is sounds like – an unobtainable, or very hard-to-get substance. Wolverine’s claws are made of Adamantium, a non-existent metal alloy that can cut through anything. Captain America’s shield is made of Vibranium, and indestructible metal. The warp core of the Starship Enterprise uses dilithium, a substance somehow able to keep matter and antimatter from immediately annihilating. Heck, in a way, antimatter itself is a sort of unobtainium – gathering enough of it to be useful would be very difficult, and keeping it from violently blowing up any matter around it would be very difficult. When a writer needs a material that defies known laws of physics, what does he do? Same thing he always does – make some stuff up. Actually there are quite a few examples of “unobtainium” in the real world. A great example is Greek Fire – no one is quite sure how the stuff was made, but it was apparently a devastating weapon. Before modern refinement techniques, aluminium was nearly an unobtanium simply because it was so difficult to extract. Research into carbon nanotubes is a modern day quest for unobtanium – short lengths have been made, but it’s extremely expensive to make. This is the stuff that could make space elevators possible, so let’s hope there’s a breakthrough soon. 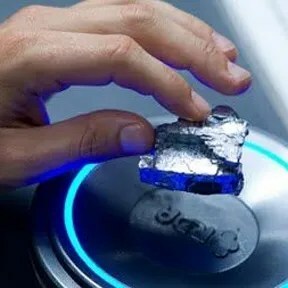 http://tvtropes.org/pmwiki/pmwiki.php/Main/Unobtainium – Don’t blame me if you get stuck at TV Tropes for a few hours! Time for T in my Sci-Fi themed A-to-Z Challenge! The grandfather of the T.A.R.D.I.S. and the DeLorean! Ah, where would sci-fi be without time travel? Well for one thing, there would be around fifty fewer episodes of the various Star Trek series, and no Doctor Who. Damn. Time travel into the future and past has been around for a very long time, but the idea of using a machine to travel through time can be credited to H.G. Wells. Stories about time travel usually have people visit historical moments, or go to important events in their own lives. A constant theme in stories with backwards time travel is the idea of changing the past – that a time traveler could create a new history by going back and doing something differently. I am posting this picture only to get the theme music stuck in your head. Well, going into the future, sure, that’s possible. You could travel close to the speed of light for a few years, and come back to Earth to find everyone you know a lot older than you. As for getting into the past, that’s impossible – so far. There are solutions for many physical equations that work regardless of which direction time is going, which seems to imply that the universe could allow you to go back in time. If something were to go faster than the speed of light, it would effectively arrive at its destination before it left. However, no experiment has yet shown anything go faster than light, or go back in time. Scientists who study this aren’t sure how to get something back in time if it is possible, and how cause-and-effect paradoxes (like killing your parent before you are born) would be accounted for. It might just be that there is an undiscovered law of physics that either prevents backward time travel completely, or that prevents you from changing anything.